There have been reams of print and now television and video footage on the life, times and miracles of Raghavendra Swamy, the Bard of Mantralaya and the Kalpavriksha Kamadhenu of Kailyuga. Much is known about the “Mahime” of Rayaru as he is affectionately called. His works are classics, his miracles all encompassing and his Brindavana a source of inspiration and devotion to one and all. When I began reading books on Raghavendra Swamy and the contemporary accounts of this great seer, I slowly realised that apart from being a gentle and humane person, he was a true task master and he set himself high standards which he, however, easily breached. Whether in private life or in public, Raghavendra always radiated calm and peace, scholastic demeanor and even temperament. I went through the sayings of his cook who accompanied him on his many travels and also books such as Raghavendra Vijaya and family accounts and found out that he practiced what he preached. Once he took up Sanyasa, the life of Raghavendra underwent a sea change. He devoted more and more time to training and teaching disciples, writing books and debating with scholars. He kept up a punishing schedule which he followed even when he went on tour. Whether it was Kumbakonam where he spent his formative years as a Sanyasi under the guidance of Sudhindra Theertha or Bikshalaya or Bicchale where he spent 13 years, his schedule was almost the same. I take this opportunity to write a few words on the daily life of our beloved Rararu in Kumbakonam. Please remember that there is perhaps no eyewitness account and the events have to be pierced together from different sources. The most authentic source continues to remain Raghavendra Vijaya. Another book is by Korti Sreenivasa Rao. One indisputable aspect that we can reconstruct from the daily life is that Raghavendra Swamy was always at hand to help those in distress, teach his Shishyas, bless his devotes, write books and commentaries in his clear and lucid style and spread the message of Dwaitha Siddhanta (philosophy). Raghavendra Swamy enjoyed a busy schedule and this part deals with his daily life in Kumbakonam. He had just been anointed the successor of the Sri Matha by Sudhindra Theertha and he had taken charge of the Matha and its affairs. Sudhindra Theertha had entered Brindavana at Nava Brindavana in Hampi and Raghavendra had come back after personally overseeing the arrangements at Nava Brindavana. Sudhindra Thertha himself had asked Raghavendra to take charge of the arrangements for his final journey and Rayaru had done it. At Kumbakonam Matha (now it is called the Vijendra Theertha Matha. It has several areas associated with Raghavendra Swamy and the priests and matha officials will be happy to tell you), Rayaru would get up much before dawn. Hr would then commence his daily routine with a prayer to his Moola Rama and Hanuman. He would read the sacred texts and then come out of the room to see the devotees and matha officials who had already queued up for a darshan of Rayaru. He would meet the devotees and accept their offerings and bless them. While the devotees went back satisfied, Rayaru would head to the Tulasi Thota (Garden of Tulasi) in the matha. Here he would pray to Goddess Lakshmi and Prana Devaru. Rayaru then got into the palanquin and set out to Cauvery river which is a short way from the Sri Matha. (Even today, some people of Kumbakonam can guide you to the route that Rayaru to the Cauvery) All along the way, Rayaru would be reciting Gajendra Moksha Shloka. ( Gajendra Moksha is one of Shkolas in the Bhagavath Geetha. It is believed that if anyone recites this early morning, it can give us the same power as the Vishnu Sahasranama. This sloka deals with the episode of the crocodile and the elephent). The palanquin with Rayaru and some of his followers would reach the banks of Cauvery. (This spot can still be seen in Kumbakonam).The palanquin would be gently lowered and the palanquin bearers would step back with respect. Rayaru would emerge with the sacred beads in his hands and a prayer on his lips. He would then walk towards the Cauvery for his daily ritualistic bath. He would put mud on his hands and feet and wash it away in the Cauvery. Then would begin the sacred bath. He would chant the name of Narayana thrice and sprinkle water over his head.He would also offer Argya to his beloved gods. He would chant Shadakshara and Dwadasha mantras. Rayaru would then step out of the Cauvery and wear a fresh set of clothes. These clothes would be washed a day earlier and hung out to dry. Rayaru would sit down and anoint himself with the Gopichandana. Raghavendra Vijaya gives a beautiful account of the bathing scene, the Cauvery and Rayaru appearing from the water. It also speaks of how Rayaru looked after putting on the Gopichandana. Now would come the Gayatri Mantra Japa and Pranava Mantra.He would then walk upto a small platform near the rover side where an idol of Narayan was placed. He would worship the idol with water and honey in the prescribed manner. On the way was the temple of Kumbeshwara, which is the presiding deity of Kumbakonam, Rayaru would pray here and then move to the Sri Matha. His walk to the Sri Matha was heralded by the blowing of conch shell, beating of drums and playing of Nadaswara. People lined up on both sides of the street to watch Rayaru walk with his wooden Padukes.The brisk walk of Rayaru elicited the admiration of one and all. These discourses would go on till afternoon. Rayaru also took on scholars for a debate during this time. He would ask his disciples to reflect on what they had learnt from his discourse. Next would be the afternoon rituals. Rayaru would now proceed to the tank adjoining the Sri Matha for the afternoon bath. He would then start performing the pooja to his favourite Moola Rama Devaru. This was an elaborate ritual and it included performing Abhisheka to the Saligramas and to Lord Rama and other deities of the Matha. Rayaru would then take Theertha and do Mangalarthi to the deities. Naivaidya would be offered to the god and Rayaru would head to a small room in the matha for his frugal food. Afternoons after lunch would be devoted to discourses and teaching his disciples grammar and logic. The evening pooje commenced after a bath at the tank. Rayaru would perform Abhisheka to the Saligramas He then offered milk and fruits to Moola Rama and other deities. He also lit the camphor for the deities himself. It was now time for his Shishyas to lead Rayaru onto a small but decorated stage in the matha. There was a white umbrella placed to cover the elevated seat on which Rayaru sat. People would gather in large numbers to hear and listen to the words of Rayaru. Once this was over, the people would disperse and Rayaru would retire to his room and continue with his reading. It was also around this time that he wrote his works. Let me interpolate one aspect here After every bath, Raghavendra Swamy performed Sandhavandhana. Only after Sandhavandhana did he perform other poojes. During his prayers to Rama, Raghavendra often lost himself in a trance and sang Indu Yenage Govinda. He was an accomplished veena player as was his father and grandfather. This routine of Raghavendra did not change when he was on tour or when he went on Sanchara. The only change was that when on tours, he would honour scholars who had impressed him in debates with cash prizes. Though he toured extensively, Rayaru rarely ,if ever, deviated from his set schedule. This routine too remained unchanged when he settled down for 13 years at Bhikshalaya or Bichale near Mantralaya. The onloy difference was that Appanacharya personally cooked food for Rararu and prepared Naivaidya for Moola Rama Devaru and other gods. If you happen to visit Kumbakonam, pleas edo not miss the Vijendra Theertha Matha, It is here that Ragjhavendra Swamy spent his early years as a Sanyas. There are idols of Krishna and Hanuman which he worshipped. There is also a place near the Brindavana of Vijendra Theertha from where he gave discourses on Brahmasutra Bhashya. 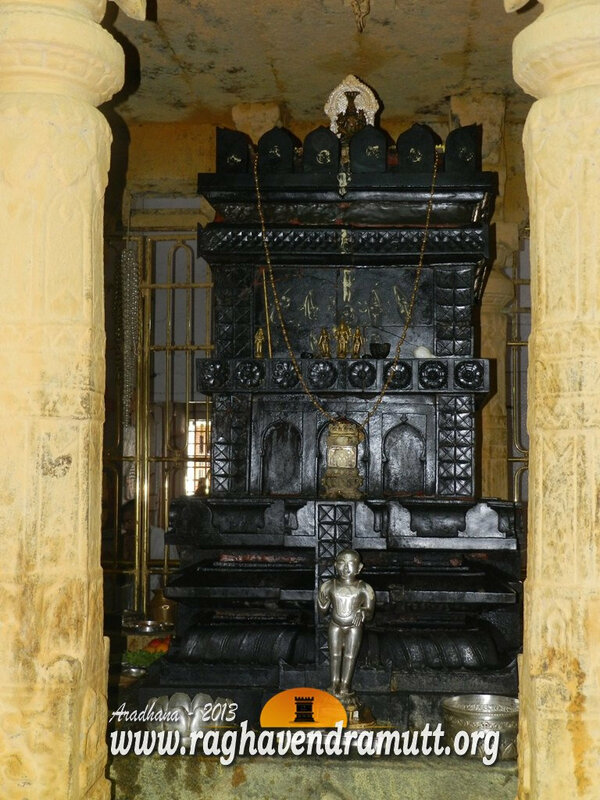 The idol of Lakshmi Marayana was installed in the matha by Sripadaraja, another great saint of the Madhwa order. Rayaru worshipped all these idols daily.